Todd Sheldon first discovered the virtues of the Mepps Aglia spinner and later realized improvements afforded by a tuft of squirrel tail while fishing at one of his favorite spots: the Wolf River. Today the Wolf continues to be a destination for sports fishermen and paddlers. Along with the St. Croix, the 225 mile Wolf River is one of two National Scenic Rivers in Wisconsin. Many of its attractions are along the part that flows from its headwaters through eastern Langlade County and Menominee County (the Menominee Indian Reservation). It is protected by the National Wild and Scenic Rivers Protection Act of 1968. The Wolf has a long and varied history, extending from the Civil War, to logging river drives, to environmental threats. In 1863, Congress approved funding for a military trail that the Union Army could use to move troops from the Upper Peninsula of Lake Michigan to Green Bay, in case British soldiers siding with the Confederacy attacked from the north. The trail in part followed the Wolf River. The State of Wisconsin built the trail though it was not completed until the 1870s and was therefore used only by the timber industry. In fact, some residents were suspicious that the entire project was arranged for the benefit of the timber industry. These routes were later used by trappers and loggers and, eventually, settlers. In the 1870s a series of dams on the Wolf made log drives possible. It is estimated that in 1873 half a billion board feet of timber floated to mills in Oshkosh. View of the north face of Mill Bridge, looking south from the dam on the Little Wolf River, Waupaca County, WI. Courtesy of the Library of Congress Prints and Photographs Division. By the early 20th century railroads had replaced river drives and work began to restore the wild nature of the Wolf. The Wisconsin Conservation Department introduced rainbow trout to the river. The Wolf River Improvement Corporation had built dams in the late 1800s and gradually began to remove them when they were no longer useful in log drives. The last logging dam was removed in 1926. Native brook trout, decimated by logging, began to repopulate the river. But environmental setbacks followed. A drought in 1931-1933 led to the diversion of water to farms. 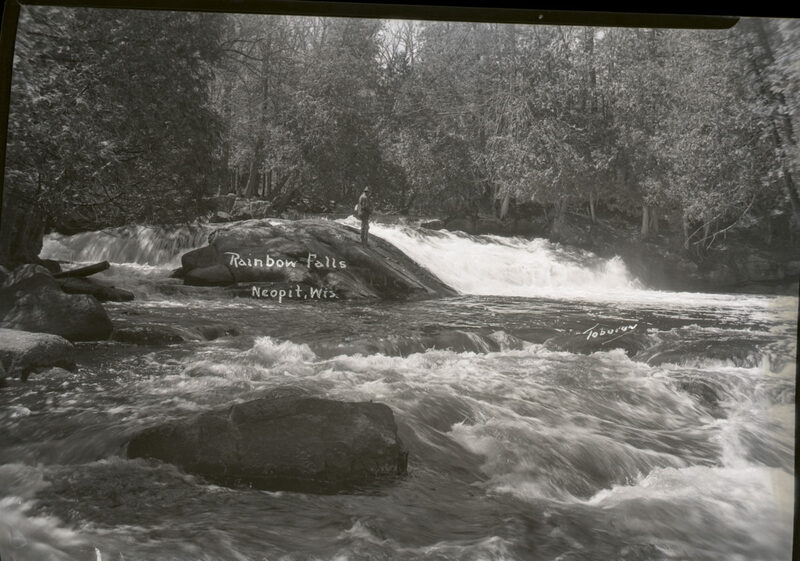 The use of pesticides in the 1950s and, later, the threat of a mine in Crandon—the headwaters of the Wolf—motivated a number of conservation groups to become active in preservation of the river. In 1967, Secretary of the Interior Stewart Udall—with help from Wisconsin Senator Gaylord Nelson—allocated $500,000 to preserve nearly 90 miles of the Wolf River in Langlade and Menominee Counties and its various feeder streams. This has become an example of restoration of a natural setting and the benefits that derive from that restoration. As a tourist destination it has impacted the Menominee Reservation as well as Langlade County economically. Robert M. Dessureau, History of Langlade County Wisconsin (Antigo, Wisconsin: Berner Bros. Publishing Co., 1922), 21-22. “Funds Released to Preserve Wolf River,” Antigo Daily Journal, January 7, 1967, 1.